The fully automated Hammer Expert Advisor is developed to trade at the start of the Asian session during low market volatility. To open positions, the adviser uses RSI and ATR indicators, the parameters of which can be changed in the settings. Not a martingale, not a grid, not an arbitrage. Deposit is always protected either by StopLoss parameter or by DD parameter. Any broker with a small spread and fast execution of orders will be suitable for trading. Minimal recommended deposit - $100. 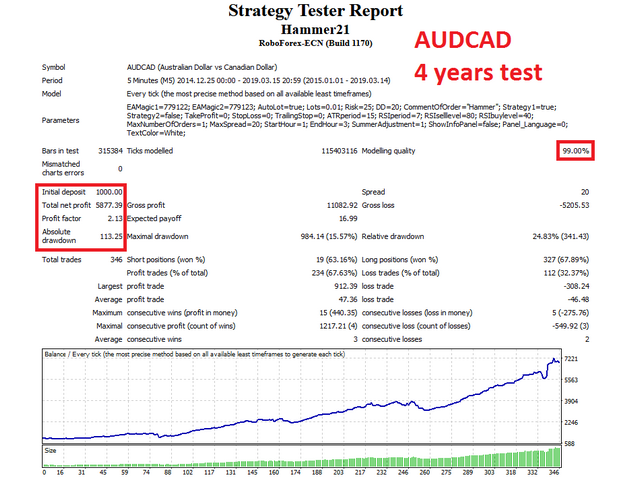 Trading on EURUSD, GBPUSD and AUDCAD is recommended. 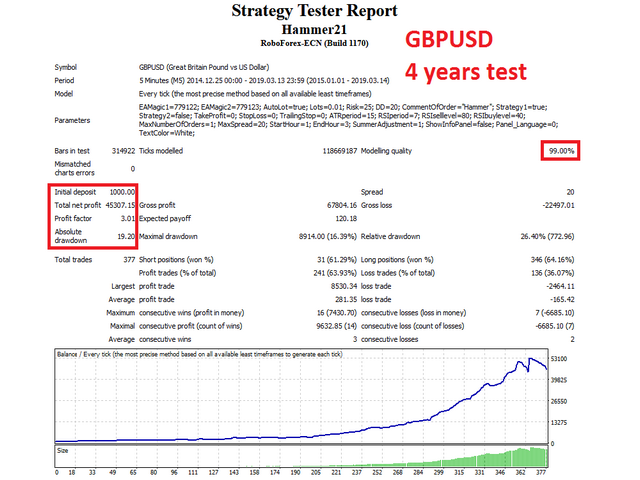 EAMagic1 - magic number of the EA for Strategy1, which allows it to distinguish its positions from others. Must have different values for every chart. 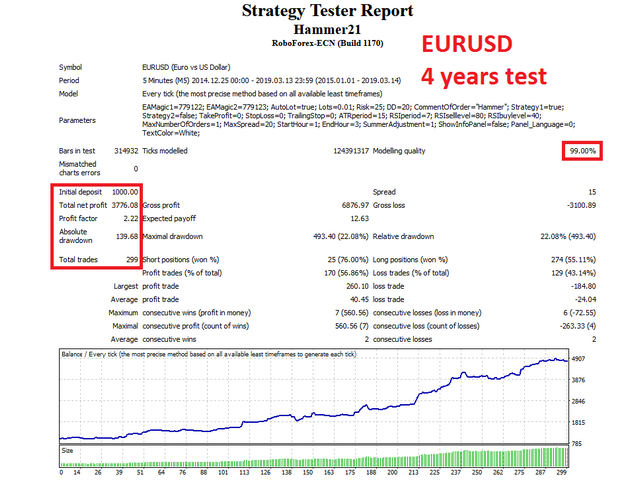 EAMagic2 - magic number of the EA for Strategy2, which allows it to distinguish its positions from others. Must have different values for every chart. DD - the maximum drawdown as a percentage of the balance, at which all positions of the EA on current currency pair will be closed. Strategy1 - can be set to "true" or "false". When set to "true" the EA uses the 1st strategy. Strategy2 - can be set to "true" or "false". When set to "true" the EA uses the 2nd strategy. StopLoss - StopLoss value in points. ATRperiod - period of ATR indicator. RSIperiod - period of RSI indicator. RSIselllevel - top value of RSI indicator. RSIbuylevel - bottom value of RSI indicator. MaxNumberOfOrders - maximal number of simultaneously opened orders. MaxSpread -maximal value of spread for the EA to open new positions. StartHour - hour to start trading. EndHour - hour to stop trading. SummerAdjustment - adjustment for daylight saving time (ask your broker). Recommended parameters for EURUSD, GBPUSD and AUDCAD for winter timezome of trading terminal GMT+2 are set by default. Price of the Expert advisor will change every week proportionally to profitability of its signal. New strategy was added. It's turned off by default (Strategy2=false). If set Strategy2=true, number of trades and profitability will be more, but risks and possible drawdown will also be more. It's recommended to use it very carefully with reasonable money-management.